KL: Mallory congrats on a great race. You beat your own course record by over an hour with a new record of 22:36:39 (fifth place overall), in a race that saw the top two women (you and Ashley Nordell) both finish under your previous record. But I get the sense that you may have had some issues this season that kept your racing minimal. Do you care to comment on that, and did it play any role in how you came into this race? MR: Yeah, this season was a tough one. I had a good race at Western States in 2017 and then learned at the Hennepin Hundred last fall what it feels like to push the pace in a 100-miler. I was hoping to build on those in 2018. Instead, I started collecting DNS’s. This year it felt like it was one thing after another. I never felt mentally ready to race. I was stressed, I was tired, I was dealing with bouts of lightheadedness. I was training, but there were too many days where it just felt like a chore. MR: My goal was to finish the race. That was all. I wanted that fourth orange star for my sweater, and another ticket in the Western States lottery. I was reluctant to hope for much more than that, because I was getting physio treatments three days before the race. The week of the race, most of my non-working hours were spent moving all of the furniture in our apartment because we were getting a follow-up treatment for bed bugs (that’s the kind of year it’s been). 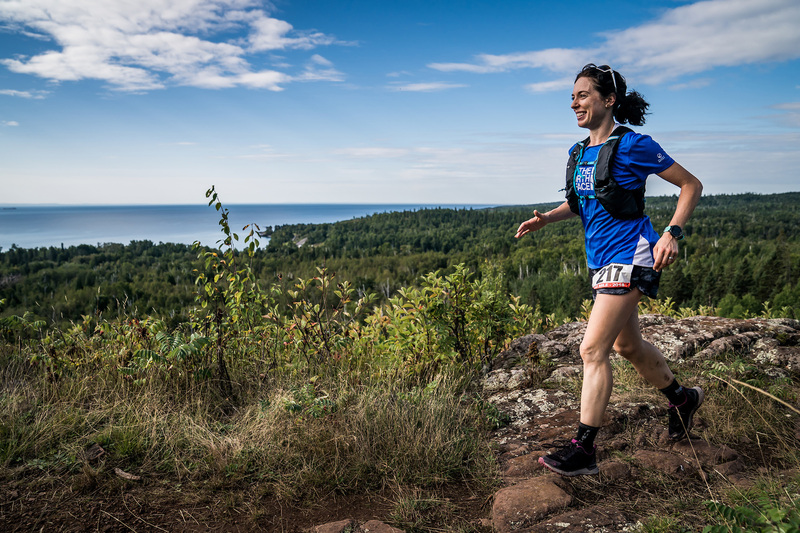 It was only when I picked up my crew, Joel, on Thursday and we started driving for Two Harbors that I started to genuinely look forward to the race. As for the race itself, it played out like a dream. I got a chance to meet Ashley Nordell on the starting line and was a bit of a fangirl. When the race started, I settled into a comfortable pace and finally remembered how much I love running. When we hit the trail section at 4.5 miles, I was struck by how it felt so “right” to be on the SHT. I made a point of enjoying my time on the trail, and staying on top of the moment-to-moment decisions you need to make to manage your effort, hydration, strategy, etc. MR: In terms of training, I practiced uphill running (as opposed to hiking) more this year than in the past. Otherwise, I relied on fitness and experience I’ve accumulated since first doing the race in 2014. MR: I had a really good playlist. I happened to take the lead when a Céline Dion song was on, and it was the same song I played on my phone’s speaker to chase away a curious bear earlier this summer. So I guess that’s like my anthem now. MR: I didn’t have any true low points during the race. Corny as it sounds, I was just so grateful to be out there. I felt pretty nauseous in the last 25 miles, so I ate a little less. KL: We’ve joked about Superior being your wheelhouse. It’s a rugged course, but one you seem to really thrive on. Any ideas why that is? MR: In short, because I love it so much. It’s beautiful and challenging. Considering I live in flat old Winnipeg, the Superior course is easier to train for than other courses because it doesn’t have as many long climbs or descents as other 100s and altitude isn’t a factor. I also grew up in a part of southeastern Ontario that has similar terrain, so before I was ever a runner, I spent a lot of time playing around roots and sharp rocks. KL: Did you have crew or pacers and if so what part did they play in your race? MR: I had some A+ crew. My buddy, Joel Toews, has crewed me at Superior four times now. He was unbelievably efficient and he knew just the right thing to say before I started each of the next legs. My husband wasn’t able to make it down for the race, but he essentially crewed me before I left by doing so much of the work around the apartment the week of the race and keeping me afloat when I’ve been stressed this year. There were a lot of people who helped me get to the starting line. I got sweet and encouraging emails from Ellie Greenwood, who has coached me, and my local contact for my sponsor, The North Face, right before the race that helped me get excited. KL/MR: Bonus Question: How do you pronounce your last name? KL: It’s French, so you pronounce it Rĭsh-ărd or Reesh-arr. Don’t pronounce it like it’s a man’s first name. When I got married last summer, I kept my maiden name because changing my name would be like letting the mispronouncers win. Also, I am not a man named Richard Mallory. I know that Mallory is a last name (like George Mallory, of Everest fame). However, this “Richard Mallory” punk has, over the years, stolen credit for my submission to a grade-five art competition, my Master’s thesis, and was even featured in a pre-race preview (on the men’s side) for an ultramarathon. C’est un nom français, et je vous remerciarais de lui prononcer en conséquence.